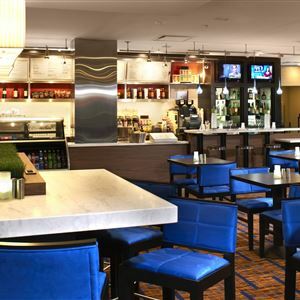 Property Location A stay at Courtyard by Marriott Cincinnati-Covington places you in the heart of Covington, minutes from MainStrasse Village and close to Newport Aquarium. This hotel is within close proximity of Northern Kentucky Convention Center and Goebel Park. Rooms Make yourself at home in one of the 193 air-conditioned rooms featuring LCD televisions. Wired and wireless Internet access is complimentary, while video-game consoles and cable programming provide entertainment. Private bathrooms with shower/tub combinations feature complimentary toiletries and hair dryers. Conveniences include phones, as well as safes and complimentary weekday newspapers. Amenities Take advantage of recreational opportunities offered, including an indoor pool, a spa tub, and a fitness center. Additional features at this hotel include complimentary wireless Internet access, a fireplace in the lobby, and barbecue grills. Getting to nearby attractions is a breeze with the complimentary area shuttle. Dining Satisfy your appetite at the hotel's restaurant, which features a bar. Dining is also available at a coffee shop/café. Quench your thirst with your favorite drink at a bar/lounge. Full breakfasts are available daily for a fee. Business, Other Amenities Featured amenities include a 24-hour business center, express check-in, and express check-out. Free self parking is available onsite. 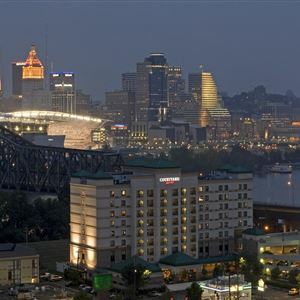 A stay at Courtyard by Marriott Cincinnati-Covington places you in the heart of Covington, minutes from MainStrasse Village and close to Newport Aquarium. This hotel is within close proximity of Northern Kentucky Convention Center and Goebel Park. Make yourself at home in one of the 193 air-conditioned rooms featuring LCD televisions. Wired and wireless Internet access is complimentary, while video-game consoles and cable programming provide entertainment. Private bathrooms with shower/tub combinations feature complimentary toiletries and hair dryers. Conveniences include phones, as well as safes and complimentary weekday newspapers. Take advantage of recreational opportunities offered, including an indoor pool, a spa tub, and a fitness center. Additional features at this hotel include complimentary wireless Internet access, a fireplace in the lobby, and barbecue grills. Getting to nearby attractions is a breeze with the complimentary area shuttle.